Cinnamon? Really? Hard to believe but it does smell like cinnamon. The small crinkly leaves are accented by lots of little pink flowers. These flowers are nice for cake decorations or tossed into a salad for color. 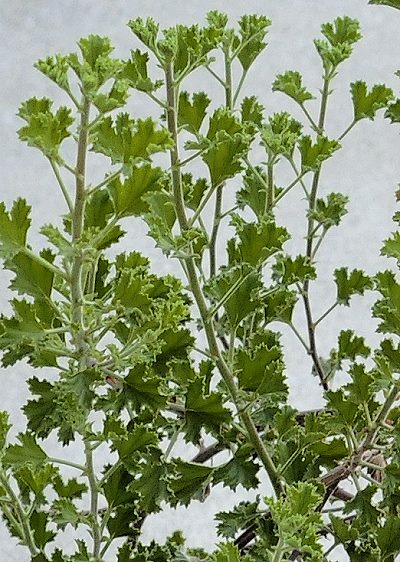 They can also be candied, as can most scented geranium flowers. 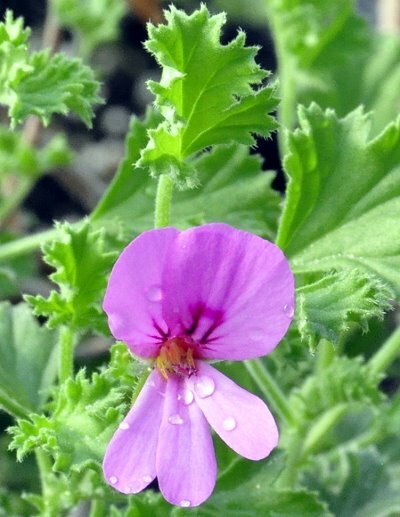 Like most of the small-leaved scented geraniums (which also includes Lemon, Lime, Fingerbowl, and Prince Rupert) it is more likely to die when the temperatures reach freezing. Grow it out in the fresh air and sunshine through the summer and then, if frost is a problem, bring it into a bright room for the winter. Be careful to water only when dry. It is normal for scented geraniums to lose bottom leaves in response to stressors like travel or being brought into the house. This should not affect the plant. After a year, it may need to be repotted. Fresh soil and a larger container will ensure continued healthy growth.